THE GIFT OF MY ART. © A poem by Caroline Street. Nelspuit area, South Africa. Caroline Street • Thank you for the welcome Sunil and as you suggested, here is another poem. This one is about artist’s (as I see them). It is a long poem but fun to read and I am sure all the artists will see something of themselves in this poem. PORTRAYAL OF AN ARTIST. © A poem by Caroline Street. Nelspuit area, South Africa. in their own creative whirl. to something tangible, something hand-wrought. balanced with form and well textured. lovingly mixed on palettes by the artists hand. smells of mediums, oils and solvents. capture smudges and spills out of hand. color wheels and references to help them out. a bottle of wine, a tureen. a figure, portrait or a bayou. that only the artist will understand. sometimes faster than the brush allows. a piece of his soul forever ingrained in shapes and color. but will fill an admirer with joy in the days to come. they are the world’s creative fount. it’s just a picture, they don’t see the artist’s heart. Johnny Johnston • San Antonio, Teaxas, USA. Was that a wink and then the piano began playing an old gospel blues song from so long ago, so far in my past and down a lonely dirt road in a place where sour weed we chewed and the cicada sang in the shadows of hibiscus and flowering myrtle. Melodies blossomed in the humid Carolina night and then blew through the screens of someone’s, somewhere back porch resting place where a newly stained battleship gray pine board porch graced a seaside home within this heart burning memories deep beneath my soul of a past now gone where innocence from another time remained lost. It was almost like I was somewhere, maybe here before, but alone, without pretensions. But the music still played and everyone in this moment still danced. 1920 was the year and that pimp banged out tunes on ivory from some place in the sunrise which lifted crushed hearts of lovers soon one and then abandoned in this nightly ritual. Now when was least expected silence drifted past the wide yawning birth in life’s harbor releasing savage thoughts and horrid memories from the past which melted dark moonless nights where a thousand searing white stars fell from heaven in silence. Tonight like every night the whiskey poured freely on Duval Street and we watched as he-she’s pranced by outside, hoping some unexpected soul might mistake their nightmare concealed in obscurity and dime store face paint, as something of beauty. Private cues held in chalked hands, razors in socks for safety, we bonded within the darkness of our souls and the history of our ancestors long forgotten and turned centuries before into dust. Vigilance was our soul mate and we held our families close, tight and in guilt, huddled in that one room, roach infested shotgun staged shack called home. Hungry when work was short and alone for those who mates and children had left in frustration or through death they sat, staring at the stars in the sky each night asking God to all souls the pain, taking them from this place into a dreamland filled with honey and promise, safety and opportunity. A place where the waters of the spirit cleanse minds and wash all that is evil into ditches of mud drying beneath the hot bright golden light of July. The sour fire of love. to the fragile silver thread. That rolls on unseen energies. Hovering on a gentle gust another. As the strata of change ripples and roams. And battles to balance the yin and yang. Pursues the aim for that illusive thread of gold. APRIL 2013 – Thursday 11th April in the CREATIVE LOUNGE Meeting of wonderful minds around the globe.., following the path of creativity.., sharing of precious timeless moments with one another.., and making new friendships!! 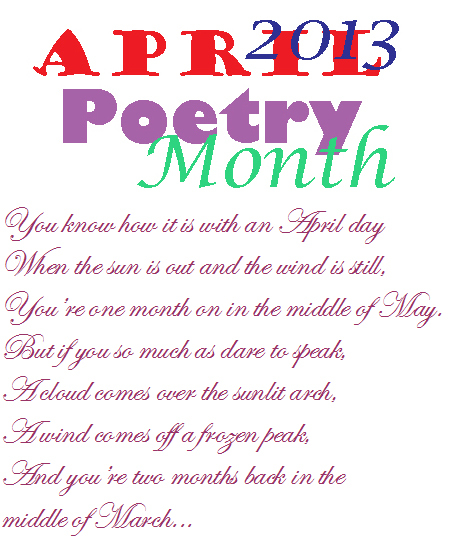 Our poetry month has added yet another dimension in our creative lounge to appreciate and share with all the members. Most of all to uplift everyone spirit to start the day, we should not loose sight of using these opportunities to keep in touch, may this new buzz and revitalized energy continue beyond April. 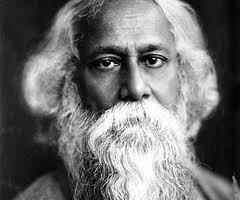 This is a poem by Rabindranath Tagore (1861-1941) Noble prize for literature 1913 Poetry / Music / Art – The first Asian to receive the honours. He wrote poetry, fiction, drama, essays, and songs; promoted reforms in education, aesthetics and religion; and in his late sixties he even turned to the visual arts, producing 2,500 paintings and drawings before his death. It’s refreshing this talk of love so I figured I’d re-post this piece about a spiritual encounter of love in New Orleans. I hope you can hear the soft piano playing gospel blues in the hall. Long past life’s faded worn gray shutters. The last place life mattered to me, anyway. Simply surrender to the inevitable. It was our last dance………. Rise upon winds existing, no longer. Permeated the aired sounds spilled upon this night in the Old Square. Soon lost to a summers past glow. Down the allies and lonely streets of time now surrendered. Now lost to the sweat of another dawn. The new dawn lightly glowing through the transom illuminating her hair, radiant in its softened light. She turned motionless peering at my image painted in mirrored reflection. And that they would vanish in the dew of the summer’s pre-dawn light. In visions taken to whispered winds and points unknown. under the bunk bed in the summer cabin. even once it has been baked… strange…important ? than separate worlds, each with its own detailed characteristics. and that seemed so primordial to me at one time. with perfume and color as to be self-contained? King of the mountain, Queen of the hill and Jack of all trades ? אולי פעם נמצא בהן שימוש. Maybe one day we’ll use them. crest of the golden horizon. And what we discover in life is that which was predestined. When did you actually think about your demise? And then your next step into the beyond? Was it today or yesterday? Or where you sought a future not yet revealed. mentioned to you in passing? convictions spoken of in His words? sought as challenges hailed upon your canopy? Did night come quickly in those days? swift inhalations of self interest and material conquests? in your strengthening, reaching for the frivolous. One runs from in the night. Sucking the very spirit from the light immersed within. Doubts confused in misunderstanding caused hesitation. Lie far beyond your knowledge and understanding. And become more than you imagined or ever dreamed. Image grows inside the Brown, Red, green ….. Image comes out one by one…. I have come home after being too long away. After shedding layers of accumulated travel dust. I have come home again; I can feel it in my bones. Can find a new home without my aggressing them. At the ends of empty beds that have grown cold. I touch, caress, anoint with my tears of joy. It has become a part of me and enjoyable. Shiver not from cold but in anticipation. Come out of hiding to reclaim their respective nails. With savory odors of a first, welcome-home meal. Turn on the water and check the oil levels. Reclaiming and filling what was somehow empty. Expand to encompass and comfort me; home again. And compassion can dissipate the chill. Tucked under my chin and warmed by a brick. Then starts ticking again in more natural rhythms. Accepted and acknowledged; home again. The Chieko Poems by Kotaro Takamura, published in 1941, have historical significance as they are regarded as some of the first Japanese poems to successfully break free from the conventional moulds of the haiku or tanka forms.., His works immediately became the best seller that they remain today. After the Second World War, Takamura exiled himself from Tokyo and lived as a hermit in a small village in Yamaguchi in northern Japan. His earlier influences that change his path to becoming a poet. Takamura was born in 1883, his father was a famous sculptor employed by the Meiji court. Following in his father’s footsteps, Takamura studied for eight years at the Tokyo School of Fine Arts. He then went abroad to further his studies. can’t imagine how much blood I sacrificed for it. Dare you even touch ever so lightly? with the mood of this moonlit night. And have forgotten how to speak. Let alone toss in a stone. An air that dared not suffer too much light. Led by a low chanting of the gods. I laid down foundations for my life, a bulwark solid. The overlapping tenets of my faith were solid, sturdy, safe. Their snug fit gave me joy and buttressed my convictions. I knew right from wrong, truth from lie, good from evil. A pavilion for my God, these truths rose in protective battlements. No mortar, chink or crack marred the surface of my walls. And I, His knight unquestioning, was His sword of truth. You enfolded me within your tender mysteries. Soft spoken words hallowed these once hollow halls. Your simple beauty fanned to flame a long cold hearth. And daylight thrust its way between stone interstices. Without waging a single battle, you had won the war. I’d overlooked somehow when cloistered in my citadel. As precious to me as my once vaunted, vaulted security? Too vital. Golden brown, they are an affront to your pale fragility. Yet they are a living testament to all the subtle strength you brought me. I know, but it’s all right. Let me go… and then, you close your eyes. The remains of my last, damned walls. The past hurt, the present struggle and the fear of the future mingles, mixes and becomes a new being: one giant shriek in my throat pummeling me with threats of failure, of inadequacy, and what-must-be. I let out a howl, a tearing hysterical sob meant to vocalize my protest. Instead, it rips open the wanting place, liberating words that fly with beating wings, escaping through every crack they can find, widening each opening until my soul is laid bare as a canyon, thirsty and ready to be filled. a chant repeated over and over in my body… uncurl your fingers, open your hands, spread your arms wide. They move in spirals inside my ears, where they took up residence so recently. Moisture collects on and under my tongue, a sublingual rainfall, where the words of elders sit comfortable and wrinkled, waiting, waiting for me to recognize them. wäre ich gleich tönendem Erz oder rasselnden Schellen. so wär’ es mir nichts zunütze. so wird aufhören das Stückwerk. stückweise von Angesicht zu Angesicht. in the flesh of our souls. Entire planets collapsing and combusting in time as inhabitants fly through the darkness we once referred to as a Quote, “A politically correct” cosmos. Then drops with sounds sinking slowly, ever so softly beneath a sturdy smooth rhythm, ethereal in a sense but aware of those things which lurk in the night. This is Detroit, a once was but now lost in despair wasteland. Trampled under greed and social engineering, a city where few who gave and the ones who took parted ways. Where laws preached by political thieves invested in life’s dead ends, leached upon he who struggled, taking and feeding a city of sluggards. Burned out cars, abandoned children and bodies dumped, in empty streets, dark alleys and open fields, a city rotting and abandoned. Where ceramic pipes charred black, works bent or busted and skunk scented blunts inhaled, transport youthful children of this workers proud past and hard fought respect into toxic dreams of riddled destruction, lost hope and lives with no substance, desires or future. Big D, a King Kong from decades past, city of design and innovation, creator of Motown mastery and automotive excellence, no longer, no more, now sits in a puddled wasteland unseen, unfit and unwanted even by those who once intoxicated with power and arrogance crowed at the world of their dominance, now resides in dark ashes of success no more. the Red, White and Blue of accomplishment and the discovery of personal potential deep within to expose, if lucky, if in the right place, a path where open doors and talent offered an escape. Little by little, time after time, rules changed, lost pride glistened of mediocrity, wages, now sucked up by unions who threatened destruction, took treasures from those who had trusted and walked away fat. Detroit, a boomtown Motown city, full of dreams, built on hope, spirit and substance, driven into the dirt by unions and political pimps who sucked the marrow from its bones and moved on. A city, maybe like a country, where masses followed false hope and citizens in blindness failed to see the deception, broken promises and lies because they became truths. A place like any other place that took the obvious and turned it in to what they wished, only to discover that they too had been listening to the horns confused cacophony, and not waiting for the sturdy smooth rhythm to follow, that those few had seen. Je l’ai appelée mon « Univers des sens ». Sunil Vilas • I was born in Zambia, Africa therefore my strong ties and connection with the development of arts & culture from Africa. 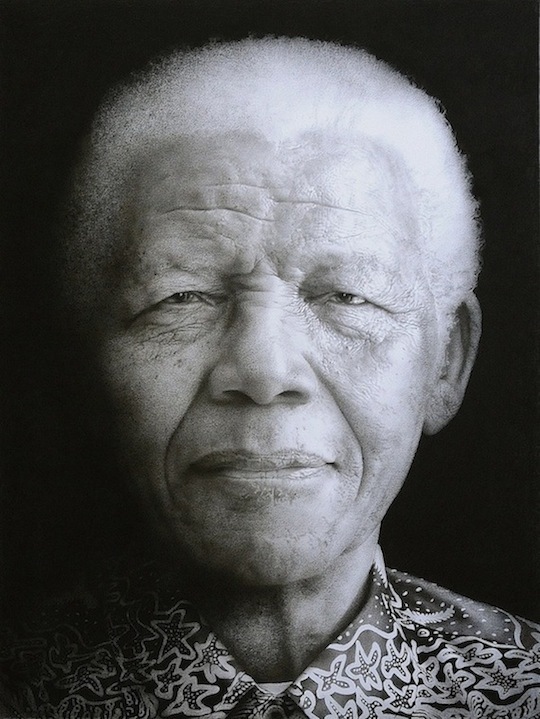 Therefore like to share my next poem made famous by Nelson Mandela. Santiago de Chuco, Peru, March 16th 1892 – Paris, April 15th 1938. He was considered one of the great poetic innovators of 20th century in any language. This month marks the 75th anniversary of his death, let’s remember him. Enjoy his poetry. there are blows in life, so powerful…I don’t know. the shoulders bones, the loneliness, the rain and the roads. Across her daddy’s hip, a tiny bag of groceries. Under her nose, sniffing and inspecting it. On Daddy with a sly, unspoken question. Whistled through it for her clapping joy. Set her on her tiny feet, watching over her. Of love sung through a blade of grass.